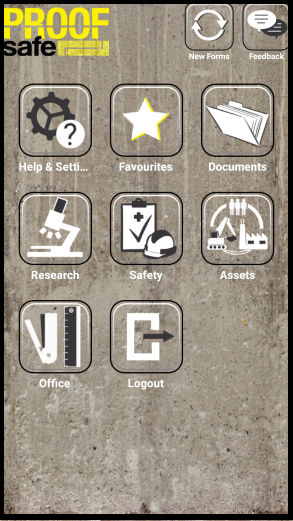 Software and an App for your entire team, keeping everyone safer and proving it. Your Pre-starts, Maintenance, Inductions, Audits, SWMS, JSEA's; whatever you need customised for your business. ProofSafe will save your business a lot of time, will improve compliance and help you win those tenders. ProofSafe includes an App and back-end software. The App sits on everyone's device (phone/tablet) allowing your teams to quickly complete the paperwork, the back-end software keeps your information current, ordered and accessible. ProofSafe will enable your teams to complete all forms digitally on or off-line, this means you can stay on top of JSEA's, SWMS, training, equipment maintenance, audits, incident reports and all other aspects of safety compliance. Compliance with Occupational Health and Safety legislation can be onerous: designing paperwork, getting everyone to read and follow it and then consistently getting the forms completed and paperwork up to date. ProofSafe simplifies the documentation for everyone so your entire team can focus on identifying hazards, having the conversations and building a safe culture without the paperwork hindering the process. You are required to keep safety records however it doesn't need to be difficult. Each organisation is unique and every worksite must be considered separately. When your team is at work you want a system that everyone can access, is easy to use and easy to adjust as the business or job or legislation requires. Companies are routinely prosecuted for not having a documented safety system. You MUST keep records, however you and your team are the experts in your field and therefore you can set up your safety systems and record keeping to suit your situation. Generic paper (or digital) forms are never suitable for every worksite, with ProofSafe it takes just a few minutes to update your forms and filling them in each day is painless. By keeping the forms current it's much more likely the team will use them properly keeping your records complete. A well designed Occupational Health and Safety Management System (OHSMS) will save time and significant costs, builds a safer, happier team and gives you a significant advantage when tendering for work. ProofSafe is designed for the user - the volunteer putting up a nest box, the factory worker using a metal press or the auditor with 5 people and a site to inspect. ProofSafe, the App, and the website are all designed to be accessible and user friendly for everyone, not just the IT team. The ProofSafe team has a varied background from mine safety to systems engineering to arboriculture, the need for a robust set of software solutions that helps businesses manage data, keep teams safe AND are easy to use for everyone is our key driver for development. We have extensive experience in some of the most dangerous work environments. This technical depth combined with the flexibility of the software ensures ProofSafe will solve problems in your workplace. Integrate digital forms and a user friendly software solution into operations. Understanding Safety Compliance and your legal obligations.